Decorating your home with paintings is incomplete without the beautiful Radha Krishna paintings. Radha and Krishna are divinity together and there is an invisible between them that’s why their devotees also chant their name together. Indian artist always tries to depict that same love and devotion in their artwork. Radha Krishna Paintings are being made for many years by Indian artist to show their devotion and love of Radha Krishna. In the paintings of Radha Krishna, you can easily feel and visualize their love. In this article, we mentioned and explain some of the historic paintings and their origin that helps you in understanding the history of Radha Krishna Paintings. To cherish the beautiful love story of Radha Krishna in the paintings mentioned some of the traditional paintings and their styles in this blogs. So, let’s have a look at it. Madhubani paintings are the oldest paintings in India because they are originated at the time of Ramayan. However, this Madhubani painting is again practised in the district of Bihar after a massive earthquake hit the areas of Bihar State. Madhubani Paintings are also known as Mithila Paintings and women of Bihar make some auspicious interior wall paintings to decorate their homes. The women of Bihar considered that Madhubani or Mithila paintings are the best way to define the love and devotion of Radha Krishna. They used to paint Radha and Krishna together on the floral background with the traditional style. In Madhubani Paintings, they also have separate Krishna Paintings with some specific story behind it. The background of these Radha Krishna paintings has mesmerizing floral or geometric pattern background. The oldest and religious Radha Krishna Paintings are found in Phad Paintings. Phad paintings are the originated in the Rajasthan State 700 years ago. The first Krishna Paintings of Phad painting was painted in between 13 and 14th century. 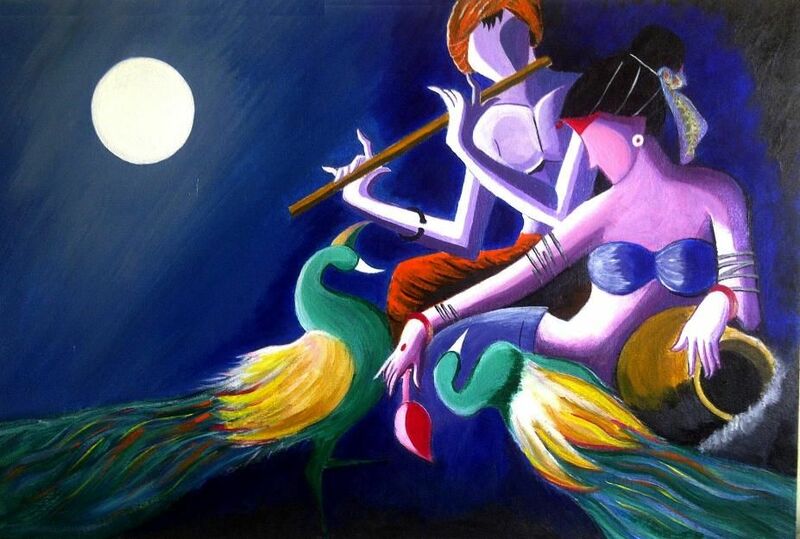 In these painting, the story of Radha Krishna is visualized in a very compact manner. Radha and Krishna paintings are made on the fabric with colours and contrast that’s why a long piece of fabric or cloth which is painted with some traditional stories is known as Phad. And in early time people used rice and wheat flour instead of colours which are known as Kalaph Banana. It also has some small boxes in the paintings to depict the different scenes and emotions of Radha Krishna story. In the Maratha Court of Thanjavur, Tanjore Paintings are originated and that’s why they are also known as Thanjavur Paintings. The major inspiration of artwork was found in the 1600 A.D and Tanjore has a wide range of Krishna Paintings and Radha Krishna Paintings. It is basically a traditional style of South Indian paintings. These paintings are done on a wooden plank which is known as palagi padam and people of south Indian region decorate their interior walls with the Tanjore Radha Krishna Paintings. In Tanjore Painting, you can also get some separate paintings of Krishna playing with his friends, doing Rasleela and teasing the Gopis of Gokul. In the paintings of Radha Krishna, a mesmerizing love story can be easily found in the colour combination of Tanjore paintings. The devotion of painter and love of Radha Krishna is perfectly conceptualized in these Tanjore Paintings. Pichwai is the most devotional painting which is done on fabric and paper and this painting portrays the story of Lord Krishna and Goddess Radha. It is originated in the Aurangabad, Rajasthan and Deccan area of India which narrates the different tales of Krishna. The word Pichwai comes from Sanskrit which hanging at the back. These paintings are in huge size and most are done on a large size of fabric. the most famous collection of Pichwai painting is the portraying the Rasleela of Lord Krishna, his childhood stories, love stories of Radha Krishna, killing scenes of Pootna and Kans and other scenes of Lord Krishna. Pichwai paintings are mostly painted with natural colours instead of synthetic colour. If you are a true devotee of Radha Krishna then you should purchase a painting of any these category to decorate your interior walls. I dugg some of you post as I cerebrated they were extremely helpful very helpful.